Welcome my avid reading friends! Today I’d like to introduce you to a fellow writer. Christopher D. Morgan. Meow. 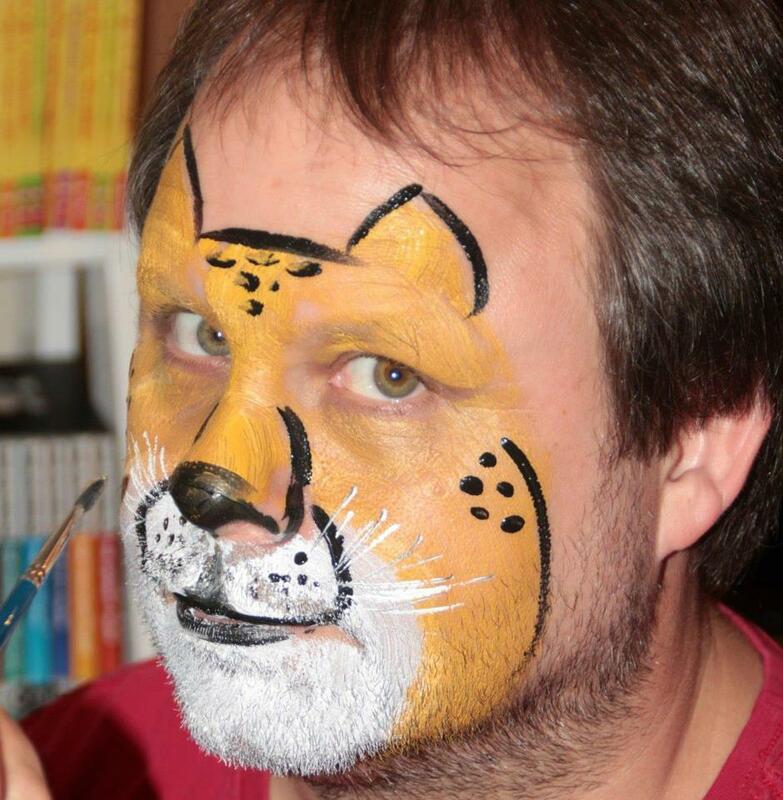 I love the face painting. So Chris, tell us a little something about yourself. Ok, let me think. During an 18 month back-packing tour around the world with my wife, Sandy, I was nearly killed numerous times. I was charged by an angry bull elephant in the Okavango Delta in Botswana; I fell off a quad bike (it landed on top of me) whilst racing over the dunes in the Namibian desert; I narrowly escaped injury from a Lion in the Kruger National Park in South Africa when the animal captured a baby baboon just a few meters from our position; I ran out of air on a SCUBA dive off the west coast of Thailand; I found myself in the midst of a military coup whilst in Quito, Ecuador; I was in a high-rise hotel in China when there was an earthquake; I was nearly bitten by a sea-snake, which I was later told was about 10 times more venomous than the most venomous land snake; oh, and I missed the Thailand tsunami by just a couple of days. Wow, not really what I was expecting to hear. It sounds like you have another book you could make just from that. I also love that you’re wife’s name is Sandy. I don’t meet many with the same name as myself. What book would you like to tell us about? At the moment, I’m promoting Forestium: The Mirror Never Lies, which is book 1 in the Portallas series. It’s a thrilling adventure set in the magical world of Forestium, where weird and wonderful creatures abound. Ooooh, I absolutely love fantasy and that cover. I’ll have to add this to my reading list. Do you have a blurb or a synopsis? Joshua’s life is on the line as he attempts to navigate through the magical world to find the truth about his father. He and his companions will need to use all their cunning to stay alive and avoid the dark forces of the Goat. Will Joshua find the magical orbs and open the Portallas, a gateway to other worlds, before he is killed? The Goat? I haven’t heard a story with a Goat as the enemy yet. I’m intrigued. What, out of all your own characters, is your favorite and why? I like all my characters but I do have a soft spot for Sarah and Galleon. I deliberately wrote Sarah to be a runaway enthusiastic young woman who is extremely intelligent and ingenious. She has a solution for every problem and the traveling companions must rely on her abilities on multiple occasions. She is everything I would like my daughter to be when she grows up. Galleon makes me laugh. He has a slicing wit that is reminiscent of the kind of humour I’m familiar with from growing up in the UK. What make this books so special to you? I think an author’s first published book will always be very special to them. For me, it’s not only the culmination of all the hard work that went into it but it has proven that I could do it after all. I have found that my first book is always in revisions. Never satisfied I guess. Who is your favorite author? I love her Harry Potter Series. Of course. What inspired you to write for the first time? I’m quite late in the game with my writing career but for me the main inspiration was to put my writing skills to some practical use. I always felt I was good at writing and my travel journals have brought many people lots of pleasure. Taking on a full-sized novel and a piece of fiction were both firsts for me, however, so I was always very nervous about whether I could pull it off. It’s never too late. What keeps you coming back to writing? Ask me again in a few years! So far, I’m really enjoying the process and all the positive attention I’m getting from book 1, so I’m really happy to be continuing to churn out more books. only time will tell whether I can sustain my current levels of enthusiasm. It is a very rewarding hobby and career. If you could say anything to your fans, what would it be? Be careful not too give too much away. What is the first book you’ve ever read that pulled you into its world? For works of fiction, it was the Harry Potter books, for sure. I was absolutely captivated. I used to sneak off from work in London to find a quiet spot somewhere to absorb another chapter or two. I probably lost quite a bit of productivity doing this at the time. That explains her being your favorite author. What would you say to future authors you might inspire? Just do it! Stop thinking about it and have a go. If you don’t think you can pull off something substantial initially, then do what I did and attempt something smaller first, like a short story. Don’t be put off by criticism. Use it to your advantage and go back and make improvements. By all means get your friends and family to read your work but expect them to all tell you just how wonderful it is. Seek out strangers, like beta readers, to check your work. It’s the only way you’ll truly find out whether it’s actually any good. Great advice! What are the best ways for your readers to reach you? Do you have any special offers for your readers? 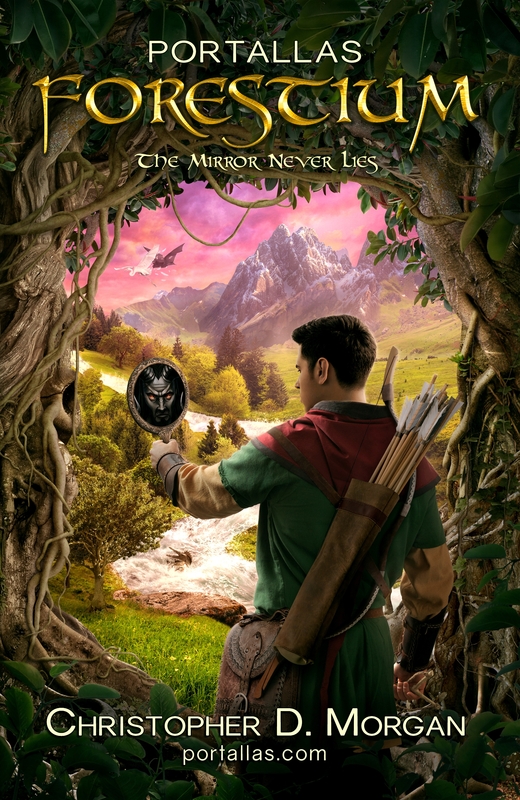 Readers who sign up via http://portallas.com will automatically go into a monthly draw for a FREE autographed HARDBACK copy of Forestium: The mirror never lies, as well as receiving special offers and other advanced notifications about upcoming releases. Thank you Chris for your time and I wish you the best of luck. Keep writing. Let me ask. I’ll get back to you asap. Hi Cameron. I’m Christopher D. Morgan, the author of the Portallas series of YA fantasy books. To answer your question, yes, all the books in the series will be featuring the same main characters – Joshua, Sarah, Andrew, Galleon and, of course, the evil Goat. However, there will also be some different characters popping up in each of the books. Forestium: The Mirror Never Lies is the first book in the series and I am busy working on book two now, which will be called Archipelago. I hope to have that book released in the coming months, so do watch out for it. There will be more books in the series after that one also!